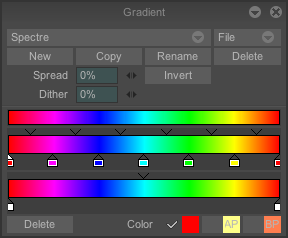 TVPaint Animation allows you to create gradients with filling tools if you enable the Gradient option. You can also open the Color gradient panel if you right click on the gradient (after you activate it) or if your go to the menu Windows > Drawing. * The first horizontal bar represents the aspect of the gradient as it will be displayed on the screen. * The second bar displays the colors chosen for the gradient. In our case, the two keys* at the end indicate the A color on the left and B color on the right. * The third bar indicates the opacity chosen for both colors. 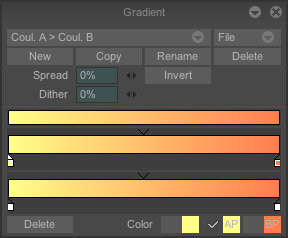 As for the mixers and palettes, there are pre-defined color gradients which you may Copy, Rename, Delete. 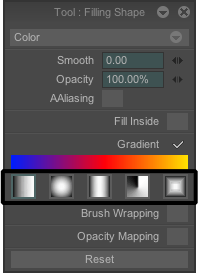 These pre-defined gradients are accessible in the popup menu indicated in the image below in the Gradient panel, on the top-left corner. * A right click on one of the keys* of the color bar enables you to either delete the key*, to assign the A color or B color to it or to pick a color. * A right click on one of the keys* of the opacity bar enables you to either delete the corresponding key* or to set its opacity (or alpha value). * The spread number field mixes the pixels within the current gradient. * The keys are symbolised by a colored rectangle o. * The Dither numeric field works in the same way as the Spread numeric field but uses colors which are not necessarily among those you have chosen, although they are quite close to them (this process is often used in the video sector). * The Invert option flips the current gradient. * The cursor enables calibration of the transition area from one gradient to another. * The File popup menu enables you to load or save your gradients on a memory support. You may also choose to recover the pre-defined gradients of TVPaint Animation if required. When the gradient field is ticked on the Filling shape panel, several types of gradients are available to you (click on one of the five buttons on the panel…). From left to right: the gradients Linear, Spherical, BiLinear, Radial and Rectangular. 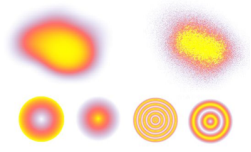 Assigning a color or opacity gradient to a drawing tool provides a wide variety of interesting visual effects (see example opposite…). The more power applied to the tool or the more repetition on the screen, the more its color will cover the gradient chosen.